Energy is put into the cells causing them to reproduce faster. This helps the area heal more quickly. The laser significantly reduces the pain at the site with the release of endorphins. There is no anesthesia required as your pet feels only a little bit of warmth in their tissue. The beam of Laser light is continuously passed over the affected area for usually 3 to 8 minutes per site (the length of time depends on the size of the pet and the size of the treatment area). During this time your pet feels extremely comfortable. You are able to stay in the room with your pet while the laser treatment is done by a technician. Most chronic conditions require at least 4 or 5 treatments in order to see noticeable improvement in mobility and pain reduction. In cases of more acute pain some pets will respond positively with just one treatment and should be done as soon as possible- after the injury or disease starts. Treatments are cumulative in nature; especially with chronic conditions. It may be necessary for your pet to get regular treatments, or booster treatments, to maintain the positive effects long term. 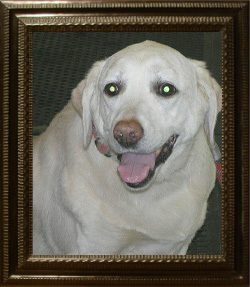 "Maizy is our beloved 11 year old Labrador who has inoperable liver cancer. Recently she became lame and was obviously in a lot of pain. We figured this was likely a metastasis of her cancer and we were heartbroken that we'd soon have to say goodbye forever. No one is ever truly prepared for this. We brought her in and Maizy was diagnosed with moderate arthritis. We agreed to medication intervention and laser treatment on the affected hip. The results were amazing. The day after her initial treatment, the pain in her face was not so pronounced and her gait was much improved. Following a few more treatments her gait was significantly better; we could once again go for short walks or fetch the ball a couple of times. The ecstasy (a "doggy smile") and her total relaxation while she is receiving laser treatments from her new best friend technician Melissa Lane is priceless. We are so impressed with the outcome that we recently continued and expanded her treatment to include her spine and her legs. Thanks for helping Maizy - and us- enjoy the rest of her life."